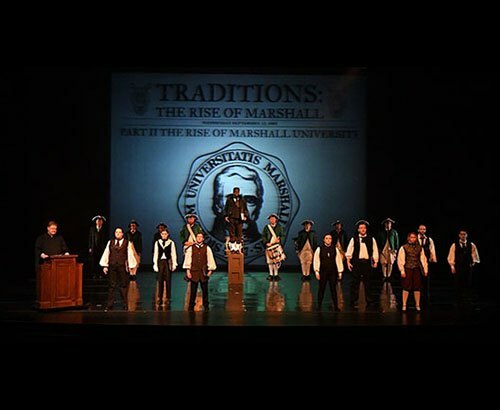 The multimedia presentation “Traditions: Echoes of John Marshall” will be performed in the Joan C. Edwards Performing Arts Center this weekend on Friday and Saturday evenings, Sept. 8 and 9, at 7:30 p.m. The live performance supplemented with multimedia was first presented during Marshall University’s Week of Welcome for new students. This weekend, performances of “Traditions” will be given for the public. Big Pear Productions, a music and media productions company owned by Marshall University visiting professor Jesse Nolan, spearheaded the project. The presentation was designed to present a snapshot of the history of Marshall University, with an emphasis on the traditions and timeline identified by Marshall’s Week of Welcome planning committee. In addition to live acting and singing, video packages will serve as introductory and transitional material throughout the production. Combining past images of Marshall and current images and video will show the passing of time and put the spotlight on achievements of different university departments. Tickets are free and available at the Joan C. Edwards Box Office until Sept. 8. Due to space constraints, tickets are limited to two per person. For more information, call 304-696-ARTS (2787).